Poetry is Jazz. 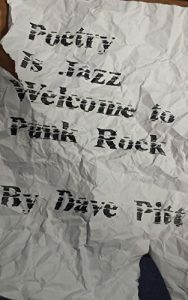 Welcome to Punk Rock is my first collection of poetry to hit the shelves both virtually and physically. It is full of attitude, hard edged, sometimes funny, sometimes uncomfortable but impossible to ignore. You can buy the eBook version from Amazon and if you want a paperback then just email me and we’ll sort something out. But it is not just poetry for the page. It’s also meant to be performed. You can see me performing some pieces from this book to “sample the goods”.